This week’s Sunday Supper event is all about Valentine’s Recipes For Two! So all the bloggers taking part to this event will post recipes for two. Don’t you just love it? I think it is a very clever idea! Obviously, if you want to make one of the dishes for more people, you can simply multiply the below doses for as many people as you like. For this event, I thought I should share a chocolate recipe (who doesn’t like chocolate for Valentine’s Day??) and I wanted it to be an Italian dish. When I looked through my Visual Archive, I was shocked to see that among my 600+ recipes, I still hadn’t posted a Chocolate Budino recipe! Budino is a very common dessert in Italy… it is what kids have for tea time very often and I think I grew up on this as well as on Nutella!! Hehehe I remember clearly that my neighbour’s mum would often make it and she would give me some too. Chocolate Budino is soooo good. It is creamy, but more solid than a mousse and believe it or not, it is actually very nutrient, so it is perfect for children and adults alike. As this was going to be a Valentine’s Day post, I thought I should add something else to it… and I made some strawberry jello hearts. The whole combination worked out great in terms of colours, presentation and flavours, so I was quite pleased with this recipe and I am very happy to share it with you today! Enjoy! 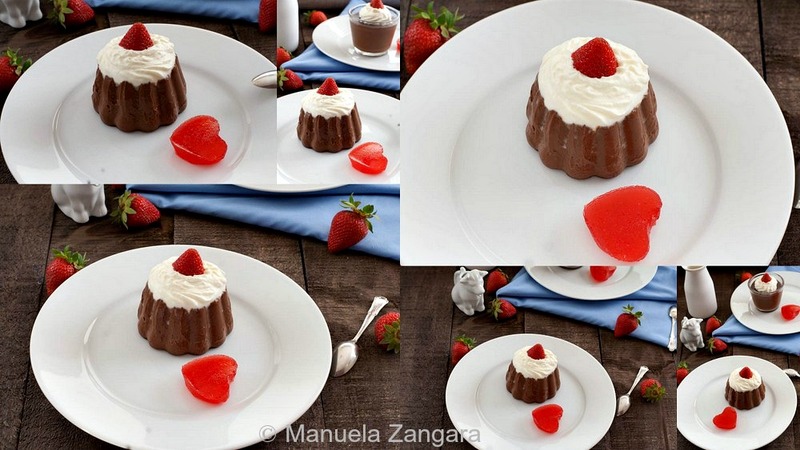 Chocolate Budino with Strawberry Hearts - the perfect chocolate pudding recipe to give your Valentine's Day an Italian twist! Put the butter in a saucepan and let it melt on a slow flame. Slowly add the warm milk. Add the chopped chocolate and bring to a simmer. Once it starts simmering, let it cook for 2 minutes while constantly stirring. 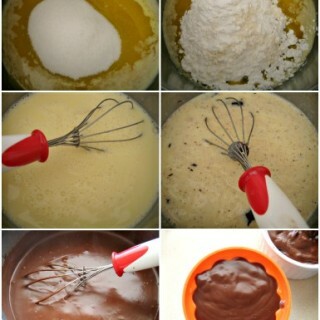 Wet the moulds with a little water and pour the chocolate mixture in them. Let the budino cool down and then place it in the fridge for at least 2 hours (or overnight) before serving. Serve cold, topped with whipped cream. 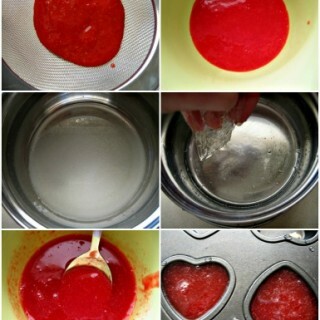 Blend and sieve the cleaned strawberries. 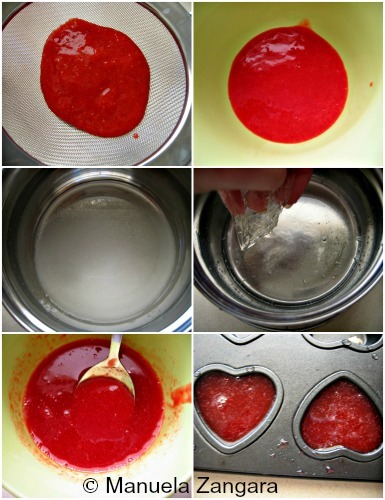 Add the strawberry syrup and enough water until you have 40 ml – 1.5 oz. of liquid. Put the gelatine sheet in a bowl with cold water and let it sit there for 5 minutes. In the meantime, put the sugar in a saucepan with 12 ml – 0.4 oz. of water and bring to a boil. Let it simmer for 3 minutes then put the fire off. Drain the gelatine sheet and add it to the hot sugar syrup. Mix well and add it to the strawberry mixture. Mix until combined. 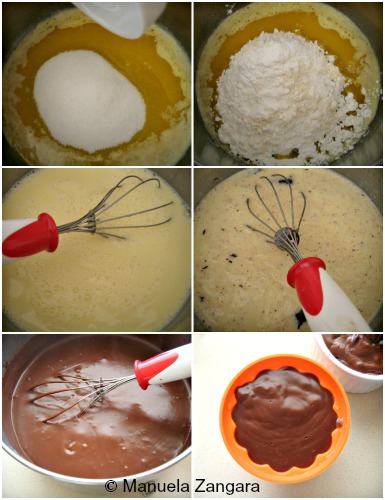 Pour the mixture into your moulds and put them in the fridge to set (this will take at least 2 hours). 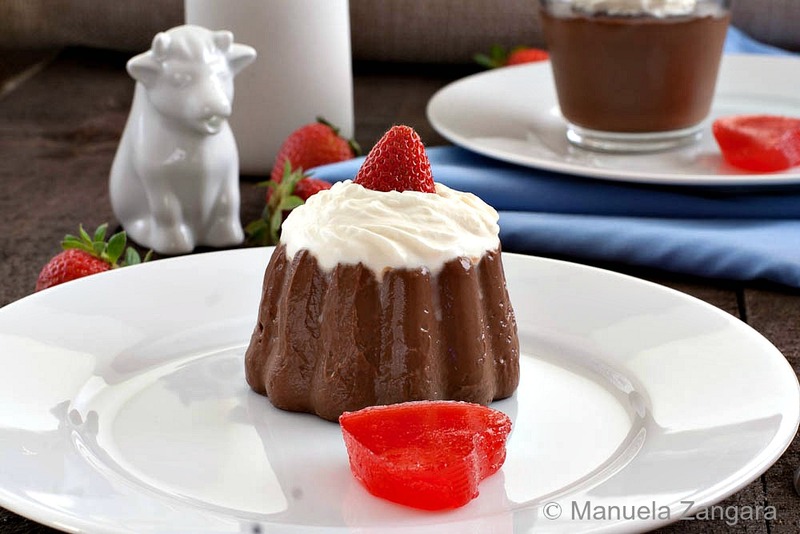 Unmould them and serve with the budino. This recipe makes 4x15 ml – ½ oz. strawberry hearts. The consistency of budino is somewhat in between that of a mousse and a panna cotta. 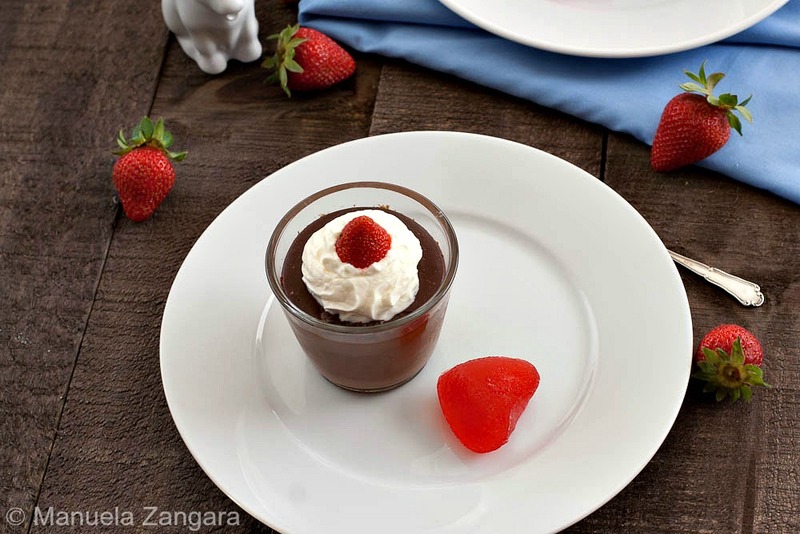 It is not as “smooth” as a panna cotta, but you can unmould it if you are very careful. If you are unsure of how to unmould it, serve it in individual glass shooters/little cups. I sooo love reading about your Italian adventures…And learning about the food of other cultures….Especially countries like Italy which embrace chocolate! Lovely, lovely photos Manuela. Thank you for the intro to budino. 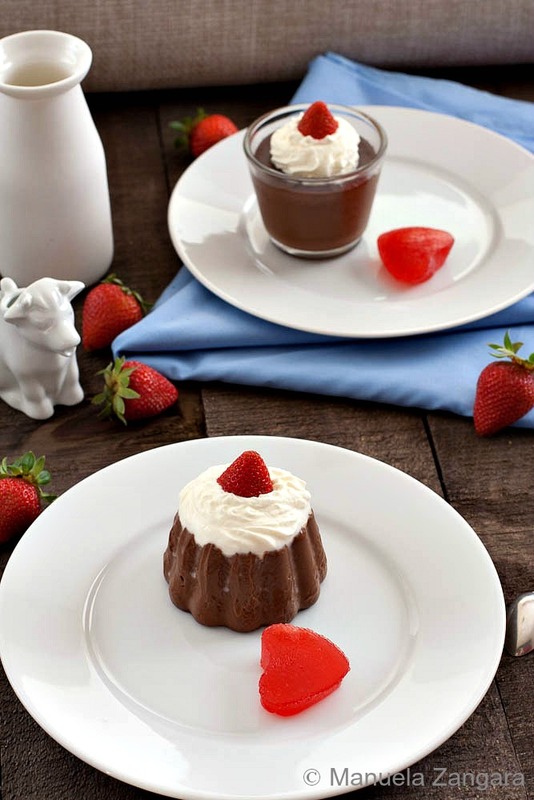 What a lovely, creamy, and chocolate-y dessert for two! Such cute strawberry hearts too. oh my goodness! your chocolate Budinos look fabulous!!! happy Vday! WOW!!! I love it! It’s so creamy and dreamy looking! It’s perfect for V-day for two!! I want this, like now!! Love the word budino! I make a Meyer lemon budino, but now I want chocolate! Oh, yes, I need to have budinos at my house! What a luscious, chocolate treat. Perfect for Valentine’s Day 🙂 Plus your homemade jello hearts are adorable!!! I’ve never made a budino — and now I’m totally inspired! Wow! This looks amazing! These are absolutely adorable! I have never made budino before, but this looks like a great recipe to try out – thank you for sharing it! This looks so decadent and delish! Stunning dessert, nothing I would want more than that on Valentine’s Day!! I’ve never tried a budino, but I’ll have to now! It looks delicious! Man, I grew up in an Italian neighbourhood but I missed out on this. That’s it, I’m making it for myself! Looks like an awesome treat. Budino sounds like my kind of dessert! The perfect dessert for date night! Love the little strawberry hearts. I am definitely going to have to make those cute hearts with my toddler. She is obsessed with strawberries. I love chocolate and they look very yummy!!! Both the budino and hearts are so perfectly set. This dessert would steal my heart any day! I’d like to have one of these right now……..with or without my sweetheart! Yummy! Great share!